Britt wrote in asking if I could give her some suggestions on how to wear her (non traditional) wedding dress again. Her dress is by Adrianna Papell and although it seems to be sold out online, if you are interested in something similar THIS dress might work as an alternative (although sleeveless). You can click on any of the other items pictured for more information. Britt wanted some options to wear to work as well as casual. First we'll start with the work options - I kept it simple because the embellishment on the dress speaks for itself. 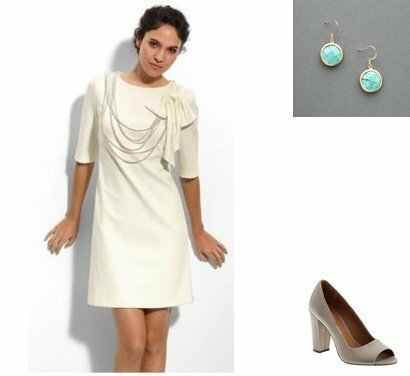 I added some neutral shoes and pretty earrings for the first set, and some coral shoes/simple jewelry for the second. For the casual look I was reminded of Chloe from the Chloe Conspiracy's bow top which she paired with a J Crew Mix Tape cardigan (see look HERE). I told Britt she may have to try it on, but I think she could achieve a similar look by pairing the same cardigan with her dress.